Gift Guide – Sleepover-Themed Our Generation Dolls and Accessories! Sleepovers are a great way to have fun and celebrate friendship, and OG Dolls love having sleepovers, too! In this Gift Guide, we showcase some of the exciting products in the Our Generation Sleepover Theme Collection so you can create the perfect sleepover experience for your dolls! For even more fun, let your friends join in! Check out our guide to discover the 12 Steps for the Perfect Sleepover and learn how to host your very own slumber party! Are you an adult shopping for kids? Click on the title of the item to visit the product web page and find the “Where to Buy” link for your area to find your local retailer! There are lots of Our Generation Sleepover Dolls for you to meet! They comes wearing pajamas, but they love to dress up in all kinds of other outfits, too! Which of the Sleepover Dolls will be your new Doll BFF? Gloria is the March 2019 Doll of the Month! and a moon plush toy that she can cuddle at night for extra-sweet dreams! Lake is another Our Generation Sleepover Doll who absolutely loves sleepovers!! 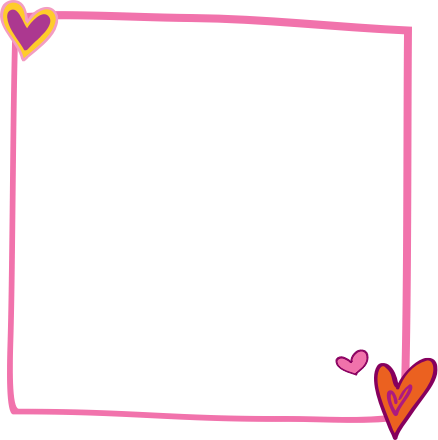 She comes wearing a cute pink nightgown with a heart on the front – the perfect look for a sweet doll with a big heart! She also comes with a soft and cuddly pair of fuzzy socks – the perfect sleepover accessories to keep her toes cozy! Jovie is an adorable Our Generation Sleepover Doll who is ready to be your snuggle bunny! She comes with a pair of bunny print pajamas with quilted pajama pants that keep her extra snuggly at night. 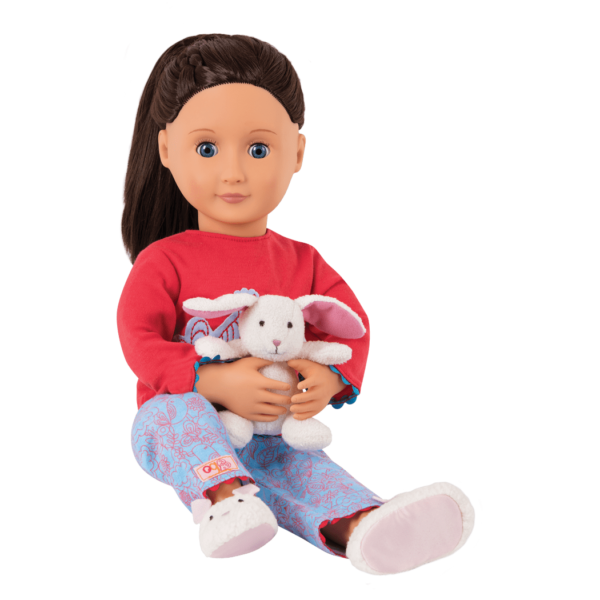 Willow is an Our Generation Deluxe Doll, who comes with two outfits, a plush bunny, and her own storybook! You can also play along with Willow’s story using the Willow Read and Play Set, featuring Willow’s signature songbird pajama set and her storybook. Keep your dolls comfortable and cozy in a great pair of PJs! The OG Sleepover Dolls arrive already wearing pajamas, but any Our Generation doll can find the perfect PJs for bedtime! There are so many awesome Our Generation doll pajama sets to choose from, your dolls could probably have a different pair for every day of the week! Who loves to cuddle and get cozy? Who can you find sneaking down the stairs for one last sip of water…or a midnight snack of yummy cookies and milk, even after lights out? It was the night of your doll’s sleepover and all through the house, not a creature was stirring…except this adorable mini plush mouse!! This holiday pajama set is made of cozy plaid, and comes with a miniature plush mouse toy for your doll to cuddle. It’s so adorable we think you could wear it all year long! You’ll want to hop into your sleeping bags with this adorable set from the OG Me and You Outfitters, a collection of matching clothes for you and your doll! 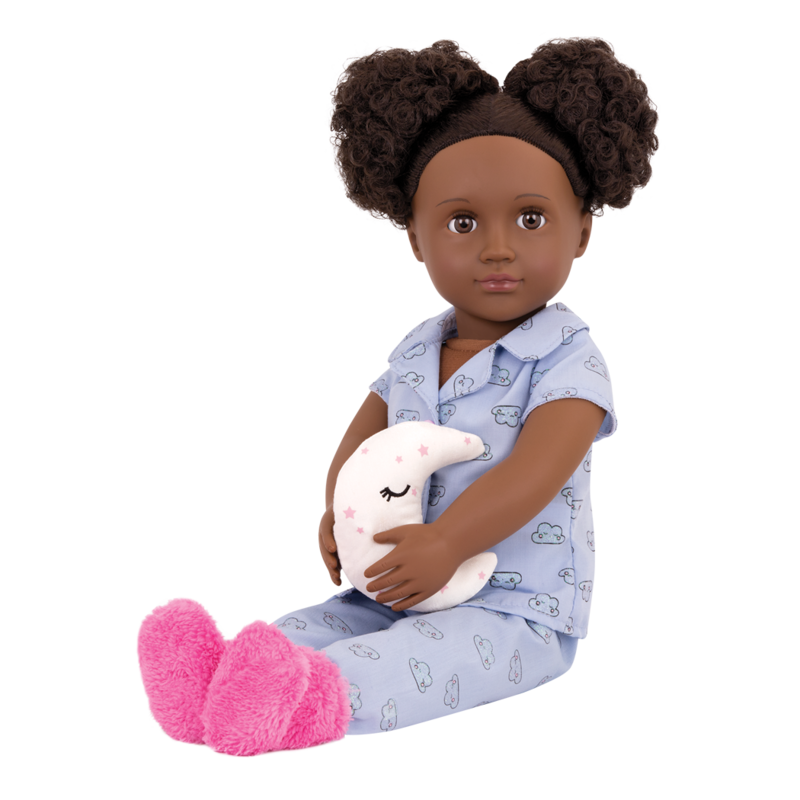 The Bunny Pajamas come with a pair of PJs that are just the right size for your Our Generation dolls, and are available in sizes for kids, too! 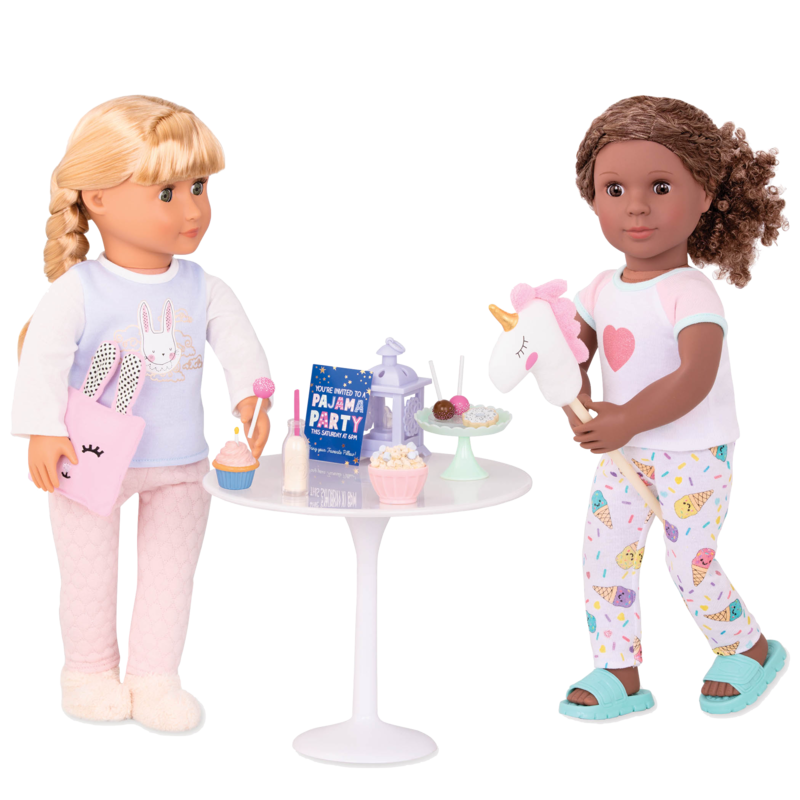 Your next sleepover will be so much fun when you and your dolls can dress the same! Do you think you’ll have the same dreams, too? only one way to find out!! With Our Generation, all you need to head towards fun and adventure is your doll and your imagination. Here are some accessories that can unlock your imagination and inspire you to have lots and lots of sleepover fun with your dolls! like the Sweet Dreams Scrollwork Bed! This adorable bed with a yellow metal scrollwork frame has a cute cat-face pillow – it’s sure to help your dolls have sweet dreams! When your dolls are getting ready for a sleepover, the Sleepover Essentials Set has everything they need to stay overnight! 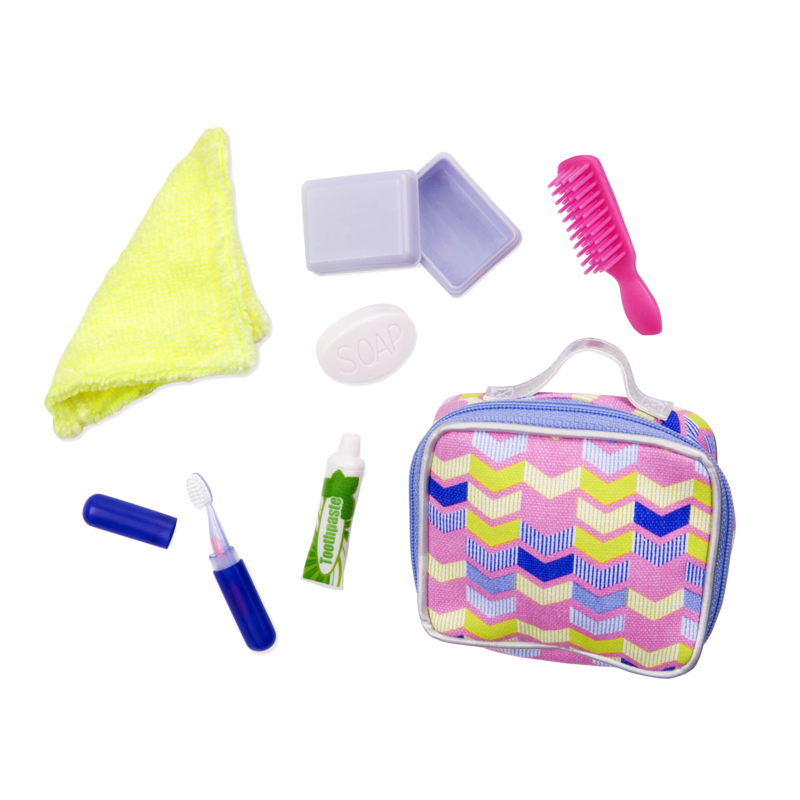 Use the brightly colored zipper case to hold miniature toothpaste, a toothbrush, soap and a hairbrush for your dolls. They’ll never forget anything important with this kit! 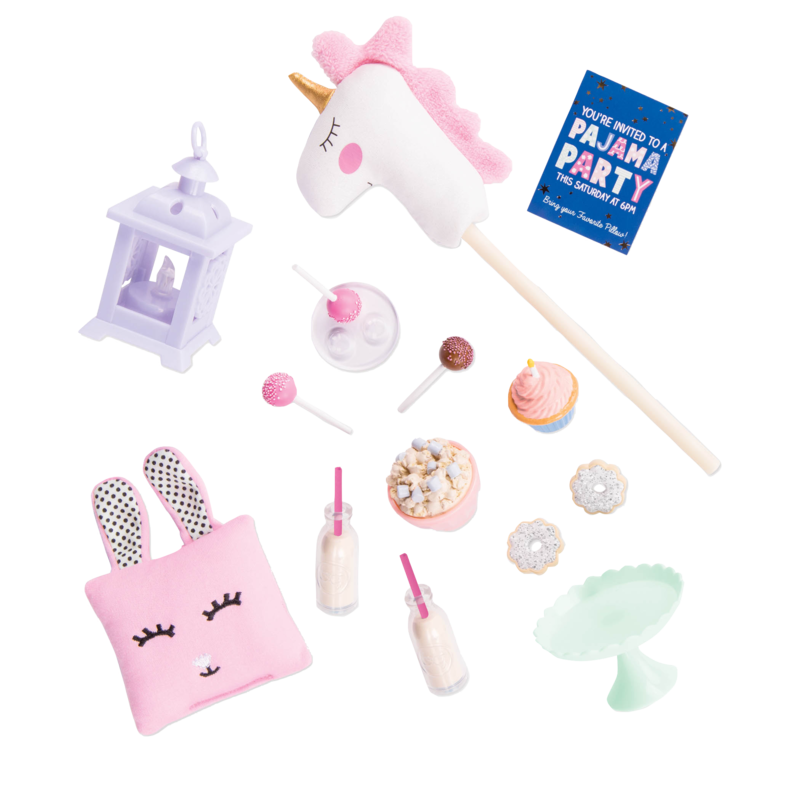 Add extra magic to your doll slumber party sleepover with the Sleepover Party Set – Unicorn! as well as a cute unicorn hobby horse that they can take turns riding around! 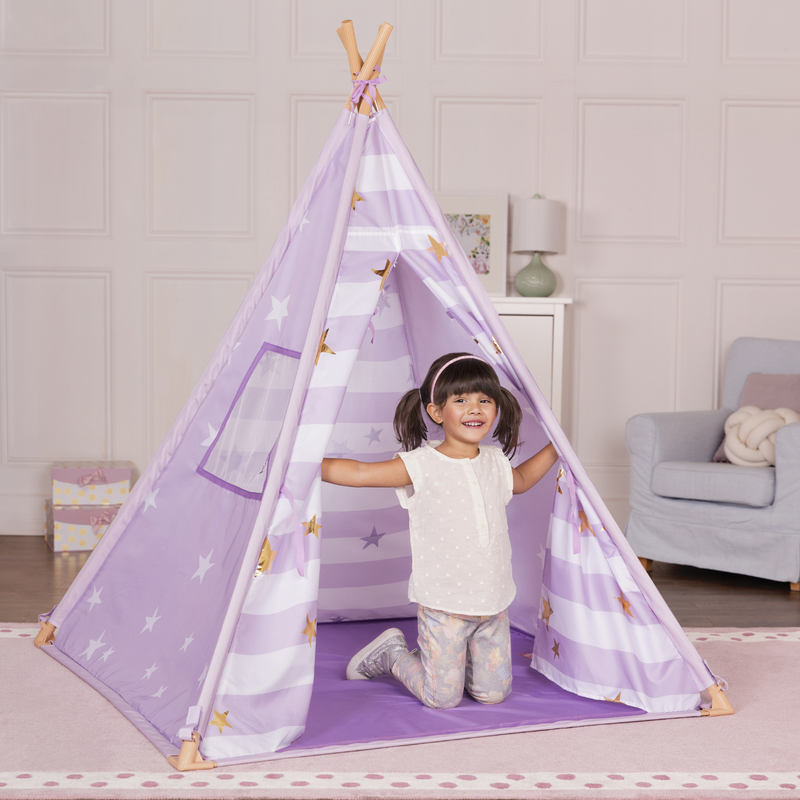 Last but not least, for an awesome sleepover party addition, check out the Suite Teepee – Lilac! Set up this kid-sized teepee in your living room, rec room, or bedroom and create a cute and cozy space for you and your dolls to relax in! Your slumber party guests will have fun playing in it, too! These are just some of the amazing Sleepover Party dolls and accessories that you can choose from! To find more, check out the Sleepover Theme page. Don’t miss our other Sleepover blog posts like the tutorial for making DIY Pom Pom Teddy Bears, Easy DIY Name Bracelets, and the 12 Steps to a Perfect Sleepover!